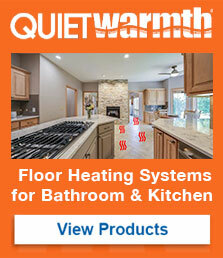 You just purchased QuietWarmth floor heating system for floating floors and was wondering if you need to have QuietWalk? The answer really depends if you need underlayment at all. If you are installing a laminate flooring on plywood or concrete subfloor, it is always a good idea to lay underlayment for sound absorption and moisture protection. The reason why MP Global Products recommends QuietWalk is at it is the same height as the wires attached to the mats. You are able to create “channels” to hide the cables in the floor to allow your floor to stay flat. You can go with another brand of flooring underlayment but their height might be different and you might have to create a channel in the underlayment and subfloor causing double the work. If you choose to not have underlayment, you will have to create “channels” in the plywood/concrete subfloor to hide the cables.